Hilo Intl. - Reno-Tahoe Intl. Detroit Metropolitan Wayne County - Reno-Tahoe Intl. George Bush Intercontinental - Reno-Tahoe Intl. Liberty Intl. - Reno-Tahoe Intl. Johnny Cash had some notions about how to pass time in Reno, but you’ve always been one for exploring responsibly. You greet strangers with a tip of the hat and a genuine smile, though if you find yourself with nothing but the horizon and acres of wide open spaces you still feel right at home. In other words, you’re comfortable on a bustling casino floor but you’d also welcome a quiet retreat to the desert where the sun on your face and the flutter of the wind are your only company. Welcome to Reno, where you can win big at a gaming table as well as in the wide open expanse of the Nevada desert. Book your Reno vacation on Travelocity today, and your package deal is no gamble. 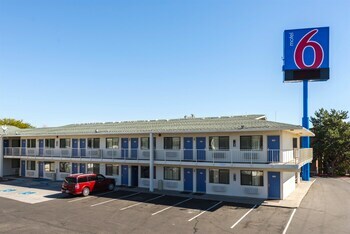 You’ll save big by bundling hotel and flight together, and before you know it you’ll be under the desert sun. Pack the sunscreen and a sense of adventure, wise wanderer. 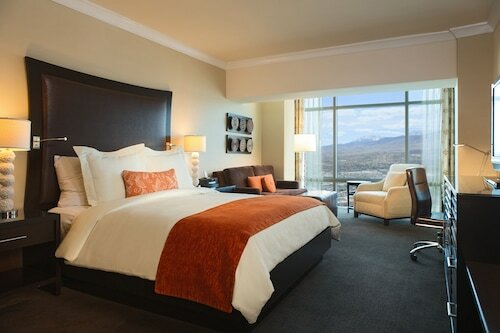 The key to a spectacular Reno getaway is booking one of the top hotels. During your time in the Biggest Little City in the World, it’s important to have a comfortable place to retire. After your big win at a slot machine or your incredible trip to Lake Tahoe, having a plush pillow to lay your head on completes the perfect day. Nugget Casino Resort: The Nugget Casino is one of the most popular destinations in Reno, and you can stay just steps from the exciting gaming floor. See live music and grab a bite to eat, all without having to leave your hotel. Peppermill Resort Spa Casino: The opulent Peppermill in Reno is stunning and elegant. Lay by the pool by day, where a waterfall crashes down the side of the hotel, and then retreat to your room with a mountain view. By evening, entertainment and dining await. 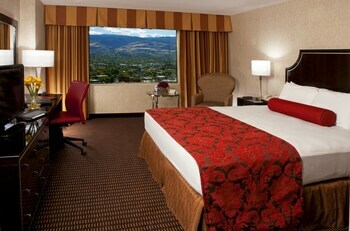 Silver Legacy Resort Casino: Stay at the Silver Legacy hotel, and you’re in for a relaxing getaway. Dance the night away at the club, and then recover the next day at the café over a cup of coffee. 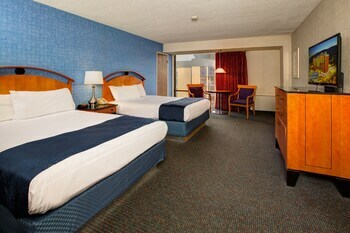 Eldorado Resort Casino: Marble archways, a spectacular restaurant, and spacious rooms greet you at this Reno hotel and casino. 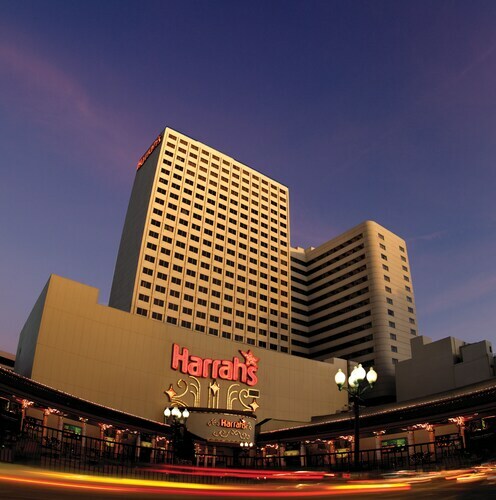 Laugh the night away in front of live comedy, and then spend some time people-watching from a seat on the casino floor. 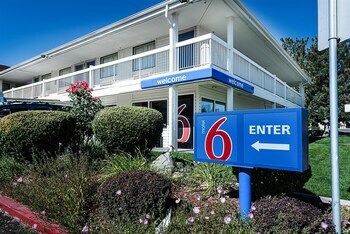 When you book Reno package deals, you have plenty of extra cash to spend at the casinos on and around North Virginia Street. If you want to sprinkle some culture into your time in the desert, head to the Nevada Museum of Art, National Automobile Museum, and Nevada Discovery Museum. Get outside with a trek in Rancho San Rafael Regional Park or a bike ride along the Truckee River. In the winter time, wise wanderer, the powder at Mt. Rose calls you to slice a trail down the slopes. When it’s time to unwind, enjoy a few hours shopping, dining, and drinking in the Truckee River Arts District. Plan your vacation in Reno around a big event, and there won’t be a dull moment in your vacation. Visit in September and you’re there in time for the Great Reno Balloon Race, as well as the Reno National Championship Air Races; the latter attracts aviation enthusiasts from all over the world. Burning Man—an experiment in community art, self-reliance, and self-expression—is hosted in Black Rock City (about 2 hours from Reno) in late August/early September, and you can enjoy a day of fun at the BBQ, Brews and Blues Festival in June. 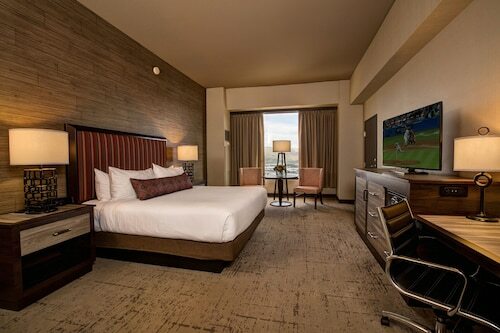 Book your vacation package in Reno today, and you’re on your way to the harmony of dinging casino floors and a mountain background that takes your breath away. When you save big on your hotel and flight bundle, you have plenty of change in your pocket for a night on the casino floor. Pack your most comfortable shoes and get ready to make your mark on the Biggest Little City in the World. Need insider tips on must-see attractions in Reno? 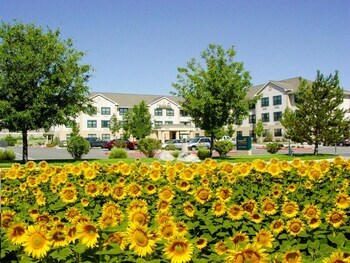 Check out our Reno travel guide! 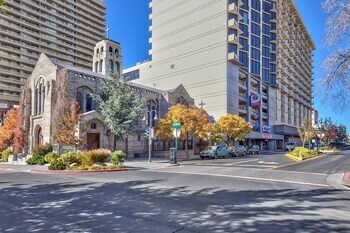 Located just over 3.5 miles from Reno-Tahoe International Airport and covering an entire city block in downtown Reno, Circus Circus Hotel & Casino is connected by skyway to the Silver Legacy and Eldorado hotels. A skywalk connects this downtown Reno hotel to the Circus Circus and Eldorado casinos; Nevada Museum of Art and Performing Arts Center are less than a half-mile away. 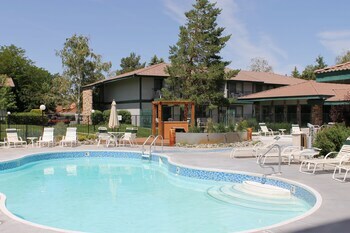 This Four Diamond resort is located in the heart of Reno's new restaurant and shopping district, just 2 miles (3.2 kilometers) from the airport, downtown Reno, and Lake Tahoe. Atlantis is the only resort connected via sky bridge to the Reno-Sparks Convention Center. 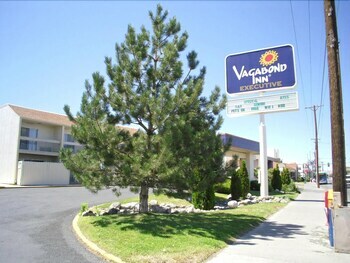 Located 1 block from Bowling Stadium and within 3 miles of the convention center, this downtown Reno hotel first opened as a bingo parlor in 1943. It now occupies both sides of North Center Street. 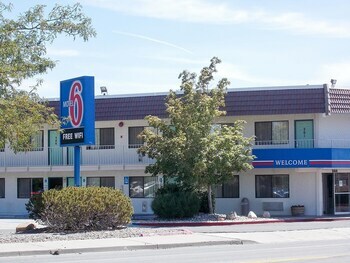 This 830-room hotel and casino is 2 blocks from Reno Arch, 4 blocks from the National Bowling Stadium, and 6 miles from Reno-Tahoe International Airport. 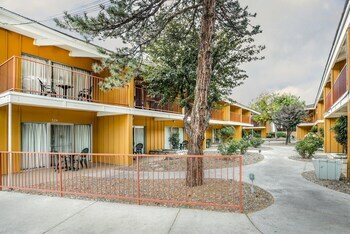 4 miles from the Reno-Tahoe airport and covering an entire city block, the Eldorado Hotel Casino at THE ROW is connected to Circus Circus and Silver Legacy by skywalk.